How Search Engines Use Machine Learning? Machine Learning is the domain that is growing perhaps most swiftly at present. Since more and more applications are envisioned to become ‘smarter’, the use of Machine Learning and Artificial Intelligence is surely to increase. Search Engines form a very good use case for Machine Learning. After all, search engines are supposed to be ‘smart’ so that they can understand your queries and give you the most appropriate results. Wherever smartness is induced artificially, Machine Learning is sure to appear at the scene. In this article, we will see how machine learning is used in the case of search engines. Whenever you write your question in a search engine, for example, Google, Bing, etc., the most important thing for the search engine becomes to understand what you are trying to ask. If a search engine is not able to understand your query well, it will not be able to give you appropriate answers, which would make the search engine useless for you. This is where Machine Learning comes into the picture. Users can make spelling errors while typing their queries in the search engines. We cannot assume a user to write all the spellings correctly. In fact, many people use search engines to verify their spellings! If you write a wrong spelling in a search engine, it shows you the correct spelling of the same word. The search engine should be smart enough to identify the word that you are trying to write, even if you have made some spelling mistake. Hence, Machine Learning is used for spelling correction in the search engines. If you use synonyms, even the most rarely used ones, the good search engines are able to answer your queries appropriately. The search engines are able to identify what you want to search. Machine Learning is used here too. Sometimes, users may ask queries which are a bit ambiguous. For example, suppose a user types the query “Indian Ocean”. Now, the query can imply the actual Indian Ocean or the Indian Ocean band. A good search engine should be able to identify the ambiguity and work a way around it. Use of Machine Learning here as well. A search engine can also classify a query into one of the various categories, for example, whether a query is navigational or transactional or information or belongs to any other category. Machine Learning is used for identification of the category of the queries. Depending on the category of the queries, the search engine may give the appropriate additional information. 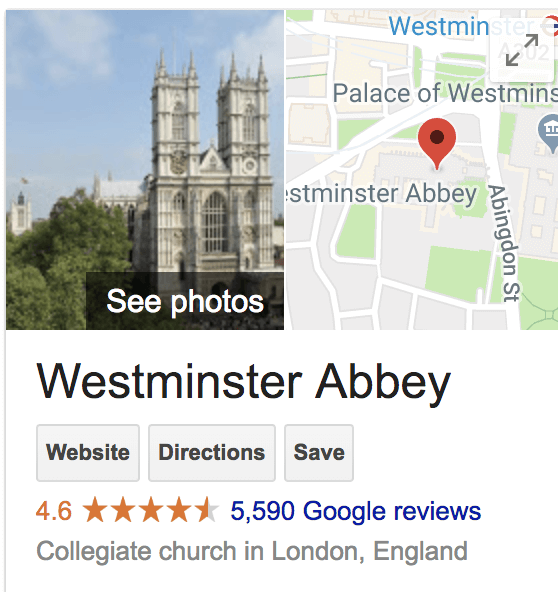 For example, if you search for “Westminster Abbey”, you will get its information and also a Google Maps location for the same. Users can upload photos on Google image search and get information about the image, similar looking images, etc. There is a lot of data in the form of images on the internet. Hence, search engines can use Machine Learning on the huge number of images and power their feature of image searching. A lot of revenue of the search engines comes from the advertisements that they display on their websites. Suggesting the advertisements that are relevant to the users increases the chance of the user actually purchasing the advertised product or service, which would, in turn be beneficial for the company providing the product or service and the search engine that advertised the product. Both will make money. Machine Learning is used by the search engines to identify the correct target audience for the showing of the various advertisements. Depending on the queries the user asks on the search engine, relevant advertisements are shown to him/her. The number of words in the English language is constantly growing. Around ten years back, no one knew words and phrases like “selfie”, “it’s lit”, “muggle”, etc. When a word or phrase is very new and is not used widely yet, the search engines may not be able to give its exact meaning. However, as more and more people start using it and it is written at several places on the internet, the machine learning algorithms of the search engines will gather the data and try to decipher the meaning of the word or phrase. Over time, the search engines are able to exactly understand it. It is very important for a search engine to show the most relevant search results at the top. In fact, the goodness of a search engine depends on this – how much relevant result is shows. In the search engines, generally, there are multiple phases in which the ranking takes place. These phases include initial retrieval, primary ranking, contextual ranking, personalized ranking, etc. These phases occur in a series. Machine Learning is used in all these phases. Machine Learning is used by the search engines to identify the spam, duplicate, or low-quality content. Some common attributes of such content are the presence of several outbound links that actually link to unrelated pages, usage of stop words and synonyms in abundance, etc. Search engines try to weed out such content from their search results so as to provide more relevant content to the users, thereby increasing the user experience. Machine Learning has drastically reduced the human effort required to identify the low-quality content. Although there are human quality raters still, the human involvement, overall, has reduced tremendously. In this article, we read about a few use cases of Machine Learning in Search Engines. Machine Learning is an ever-evolving technology, and will surely continue to expand its usage in search engines.